The Conservatory began here in the Kearsarge area five years ago. Kevin and Angela Tarleton have their Masters Degrees in their chosen fields. They ran a similar Conservatory in Texas for 22 years. Between the two, they have taught all ages and levels of performing arts as well as at Universities and both National and International Workshops. They also have logged thousands of hours performing in Musical Theatre, Shakespeare, Classical Theatre, Contemporary Theatre, Children’s Theatre and all forms of Dance. They have two children, Alyssa and Jonmichael, whom have performed and taught with them as well. In 2002, the family moved to New Hampshire because Jonmichael was suddenly stricken with asthma. The illness caused him to be initially hospitalized but was responsible for subsequent trips to the emergency room. As the illness became chronic, he ended up on a multitude of medications as well as having nebulizers at both home and Elementary School. Then Angela developed asthma. As both native born Texans, mother and son could no longer handle the growing pollution in North Texas which has now become one of the worst places in the U. S.
Kevin being from New Hampshire had always wanted to come back to his home but his family and business were now entrenched in Texas. The family visited New Hampshire for his nieces wedding in October of 2001 and Jonmichael and Angela were asthma free! Kevin and Angela decided to leave Texas and start completely over in New Hampshire. They felt the quality of life was more important than anything. So they packed up and moved from Texas to New Hampshire that following June. Jonmichael and Angela still suffer from bouts of asthma but with New Hampshire’s beautiful clean air, it is much less frequent. Angela wasn’t sure if she wanted to start over rebuilding a Studio at the age of forty two, so the first year here she taught in a large Studio in Concord. Gradually she met people from the Kearsarge area and was encouraged to start something locally. Although she loved the idea of working closely in her community, she and Kevin weren’t sure how they could afford to open up a Studio because financially they were strapped with two mortgages after loosing a contract on their property in Texas making finances extremely difficult. It was at this time that Angela got the idea to start an after school dance program in all the Kearsarge School District Elementary schools. As she contacted each of the Principals they were both supportive and encouraging. So she started out with offering Ballet I & II. The first year she had approximately 30 students and their first Recital was in the Warner Town Hall. She now has a lovely Studio in Warner on North Road behind The Market Basket, but it was a bit of a struggle to get there. After her first year she knew she needed to expand but because of time constraints and carpeted or tile floors, she knew that in only one year she had outgrown the use of the Elementary Schools. The original plan was to build a Studio on their homestead property…she even had students already signed up for the following year. It was a tough summer that year with lots of rain so getting her septic designs and building plans to submit to the Sutton Building Commitee were behind schedule. She needed a place to teach starting in September until their plans could be finished and presented to the town. Someone recommended Trinity Bible Church because they had a good sized basement. She knew the Pastor, Doug Dean, because he had been Jonmichael’s baseball coach that Spring. She called and told him she needed a temporary place because of the delays with the plans. Then after she began teaching the bad news hit: a friend who had been working with her on the septic plans said he knew the town well enough to know that they would never approve of the idea because the Studio would be on a road that was notoriously dangerous and that several teenagers had died on the road. Angela was devastated. She went back to Doug Dean and explained the situation and the Church was gracious enough to allow her to stay until the end of January. They, along with friends, especially Danielle Angeli (now Danielle Thomas) volunteered her time as a Realtor to help them search for a place to put the Studio. It was suggested that they look at the building owned by Lon Thorpe connected to Jan’s Barber Shop in Warner. It was a fairly small space but it was a perfect location. So the renovations began and we opened up in February. Lon Thorpe was absolutely wonderful and very understand in helping us get started with a very reasonable lease and then a year later let us expand and build a huge addition with an unfinished basement that we have plans to finish out in the future. The final obstacle was the week were to move into the Studio by husband who is also a builder/remodeler was offered a job in Florida following the hurricanes with a huge hazmat company he was the supervisor over procurement and had to leave immediately. I was devastated I didn’t know what to do. Then one of my Ball Room Dance couples Ken and Sue Sutton asked me after class if I was okay. I started balling and I never cry like that especially in front of my students. Ken asked what needed to be done. I told him it was all the final finish out stuff. We had to re-sand the floors because of the high tech dance floor we needed to lay down. We then needed to cut and roll the floor using a special two sided tape to attach it to the floor, we need to cut and hang the ballet barre’s, so the company that was to hang the huge dance mirrors that cover one entire section of the walls could come in and do so. Oh, and we needed to paint the entire interior! Oh again, and one more thing we had to move all the equipment form Trinity Bible Church to the new Studio. Ken not only volunteered to helps me cut and lay down the floor helped to organize other workers gathering some of his friends. My son and I along with his friend Nick Allen spent two days sanding the floors Lorna and her son Charlie Mc Connell gathered members of the KRHS Kung Fu Club along with my daughter Alyssa Tarleton and Julia Jones to help clean the building ceiling to floor. Ken and I along with Jonmichal and Nick measured cut rolled and taped the floor. Keith Brooks the father of one of my students Grace headed up the crew of Keith Badgley and John Jones that cut and hung all the ballet barre’s. Elizabeth Dill and her daughter Natalie helped Alyssa and I to paint. Then finally the mirrors were installed. And last but not least, Ira Thomas helped me gather up all the equipment form the church and move it to the Studio. These people barely knew me at the time yet they donated hours of time and equipment to help me. It really was like an old fashioned barn raising. I could not have gotten into the building without the generous heart and help of all these wonderful people. So to all of you who helped I say again THANKS! The Studio continues to grow and when Angela’s sister Michelle Gosnell moved up here from Texas, Angela asked Michelle, who has a degree in vocal performance, as well as thousands of performance hours and teaching experience, to head up a Music Program. 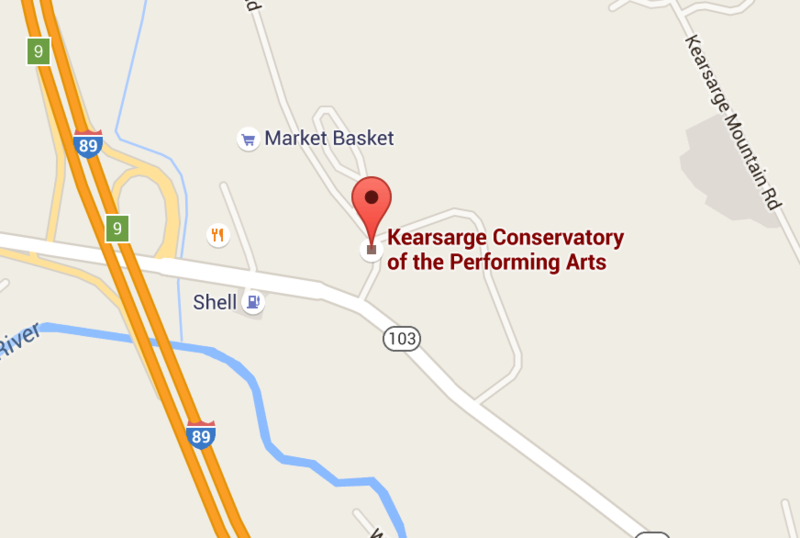 That was when the Studio changed it’s name from Kearsarge Conservatory of Dance to Kearsarge Conservatory of the Performing Arts. We offer not only all levels Dance forms: Ballet, Pointe, Tap, Jazz Lyrical and Hip Hop, but we offer some of the more rare forms such as:, Tumbling, Acro ( which is more advanced combining tumbling with dance) Musical Theatre, Acting as well as Private Piano and Voice. Recently we have gained a wonderful Jazz/Hip Hop & Contemporary Instructor Melissa Gendreau she has her Bachelors of Arts in Dance from Dean College and is currently working on her masters in Arts Administration. She will be teaches Hip- Hop, Contemporary and Advanced Tap. We are excited to have her level of professionalism as part of the KCPA family for more information on Melissa scroll down on Teachers. Last year we introduced Vincant Davis known lovingly as Mr. Cheti who is a consummate professional in theatre and dance with thousands of hours of professional performances including national and international theatre tours. The Conservatory offers lots of performance venues to our students. We Perform a Spring Show where we feature a full Story Ballet each year as well as all of the other disciplines we offer. We were also the first Company to Perform the Nutcracker Ballet in the Kearsarge area and we did it in such a way as to include all of the Performing Arts we offer not just Ballet. It was a huge success, with wonderful comments from the audience and tons of community support! We have also performed at Spring Into Warner, Warner Fall Foliage Festival, Colby Sawyer Singers Concerts , Kearsarge Community Band, local Churches, community fundraisers and Center for the Arts. We have expanding into a Junior and Senior Dance Company Art In Motion to be even more available for local community events. The latest venture of the Conservatory is to reinstate it’s Children’s Theatre. In Texas Angela along with Kim Nichols a dear friend of hers wrote over a dozen original Children’s Shows. Angela wrote the scripts and she and Kim co-wrote the music. They toured the shows all over North Texas to Public and Private Schools, Churches, Day Cares and many Public Events. It was very successful. The shows are approximately 35-45 minutes long and are musically and comically based. Teaching wonderful lessons such as stranger danger with the use of classic folk and fairy tales. After their New Hampshire Premier in February of The Gingerbread Man they had such positive response they knew they were on the right track and performed Little Red meets the Wolf Sisters for Spring Into Warner. We have added a Musical Theatre Performance at the Gala of our Drama Camp which we performed original shows written by Angela Something Like Cinderella, Sleeping Beauty, this year we added a Broadway Musical Bye-Bye Birdie and will be having an encore performance again at Warner Fall Foliage Festival. Kevin and Angela have been truly amazed with so much good will, community support and real love from our parents and students. When we first moved here several people said “good luck it’s hard bringing something new to New Hampshire”. We have found the opposite; all of the Town Selectmen, Planning Boards, Secretaries, KRSD Principals and Administrators, PTO’s, Community Leaders, Local Businesses, and especially Trinity Bible Church have been overwhelmingly fantastic to us in every way. We have been, encouraged and praised for all our efforts with absolutely nothing negative from anyone! We could not be in the place we are today with out this amount of support and we are truly grateful and very thankful to everyone. Angela as the only full time teacher at this point feels truly blessed to have a job she really loves and is looking forward to the future of the Conservatory and it’s role in the Kearsarge Community.